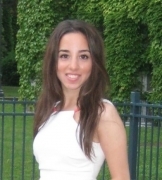 Sara is a doctoral student at the University of Toronto, Rehabilitation Sciences Institute, working under the supervision of Dr. Angela Colantonio and Dr. Sally Lindsay. She completed a Master of Science degree at Queen’s University in Anatomical and Biomedical Sciences, and a bachelor specialization degree in health sciences and biology from Western University. Sara has a special interest in the field of acquired brain injury and women’s health research.